How & when do I receive my product(s)? All our products are available as digital downloads only. You need to download and install the trial product version, then activate it with your license code. Once the order is placed, it usually takes a couple of minutes for the payment to be processed and then an email is sent to you with your license information. We comply to the regular practice of the software industry, meaning that each single-user license can be activated on two computers (for example, on your desktop computer and on your laptop). If you need to use the product on more computers, you will need to purchase additional licenses. What kind of technical support is included with my purchase? We are proud to offer a 30 days money back guarantee for all orders. To initiate a refund, simply fill the this refund request form. Do you offer discounts for volume licenses? Of course. Discounts are applied automatically, depending on the number of licenses that you select to purchase. The discount value is shown on your shopping cart. You need to order minimum 5 licenses of the same product in order to qualify for discounts. 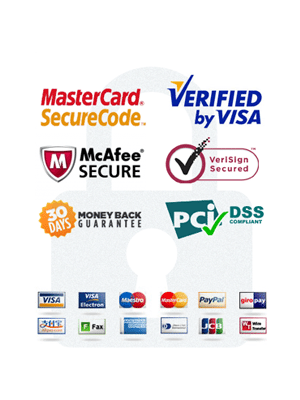 The online payment system is secured by VeriSign, tested daily by McAfee SECURE and provided by Avangate, the agile eCommerce solutions provider trusted by Software and SaaS companies to grow their business worldwide. Your personal information is not shared with anyone. We are simply not in the business of selling or sharing personal information. Can I choose not to pay online? If you don’t wish to pay online, of course you can also choose an offline payment method like a bank wire transfer. All you have to do is to add the desired product(s) to your cart, go to Checkout and select to pay by bank transfer. Your license will be issued as soon as the funds enter our accounts.